A decision by Hong Kong post office authorities to cover up the British royal insignia on the territory's colonial-era post boxes has conservationists up in arms. Hongkong Post has said the insignia is "inappropriate", as the city has been under Chinese rule since the 1997 handover, and that it may cause "confusion". But heritage groups say the post boxes are a reminder of an important part of Hong Kong's history and are waging a campaign to preserve them in their entirety. Activists believe political pressure from Beijing has prompted a recent shift towards downplaying British colonial elements in Hong Kong. An influential former Beijing official called last month for the city to "de-colonise". The Conservancy Association's assistant campaign manager Roy Ng told the BBC the post boxes are part of Hong Kong's "street heritage" and should be preserved. His association has created a Google map pinpointing the post boxes, and is urging the public to post pictures on a Facebook page as a way to monitor for changes to the letter boxes. Other activists have organised a letter-writing campaign to Hongkong Post and are also staging a protest this Saturday. Hongkong Post has not said when it plans to make the change, nor made clear what it would use to cover up the insignias. There are 59 colonial-era post boxes, with seven dating back to King George V's reign, making them around 80 to 100 years old. The red post boxes were painted green after the city was handed over to China in 1997. 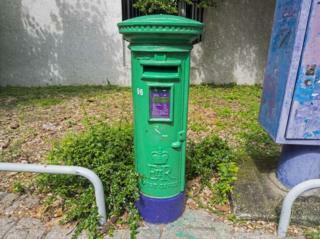 "The royal insignia is the main characteristic of the entire post box. Covering or removing it would seriously harm the post box's heritage," says Mr Ng, whose association has asked Hongkong Post to not only preserve the insignia but also paint the post boxes in their original red colour. "We hope they can be preserved so that when we walk along the street, we can have an understanding of our history. They can even be considered as tourist attractions." Mr Ng says the city government - dominated by pro-Beijing figures - appears to be moving towards removing vestiges of British colonial rule. Later this month officials will discuss another controversial proposal to remove the city's iconic trams in its Central district. "Our colonial history is still part of our history. Even if we remove all our colonial-style heritage, we cannot make that part of history disappear forever in Hong Kong," says Mr Ng.